I know there are those of you who write down things to do before you die. Everest is next up. 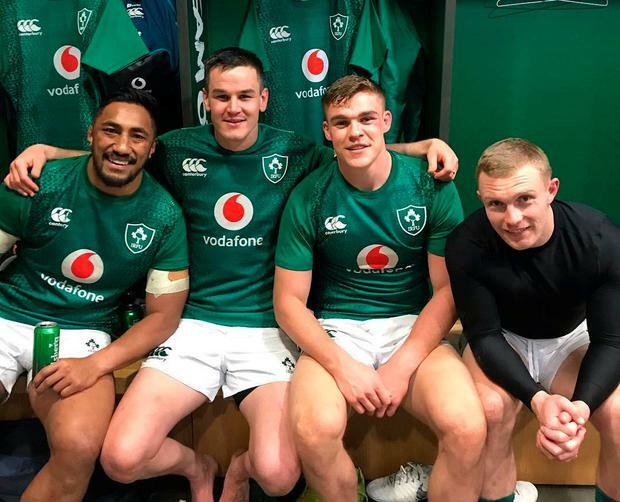 The beating of the All Blacks in Dublin is a box ticked and a wish scratched off the list. At last. Ireland out-fought and out-thought the greatest rugby nation of them all. The Irish gave their all and won a watershed victory. The All Blacks failed to score a try on Irish soil for the first time since Munster won 40 years ago. Ireland were mighty. Ireland were awesome. The rapturous crowd were so engaged that not one among them left for an egg-carton of pints in a second half that flew for a while but then seemed to never end as the All Blacks came full on in search of an equaliser. It was a game that never gave in to the exigencies of the worn-out and beaten-up. The pace was relentless. It was them or us - and us won. It's a cliché I know and our orders here are to avoid clichés like the plague. But Ireland wanted it more. In the end desire won the game of our lives. I met up with my friends before the match in the raucous rookery that was Crowe's Pub. We were approached by a wizened man who was an entrepreneur ever before Richard Branson was selling tickets to the moon. He makes up these favours from green and gold cloth, held together by a thin pin, that would come in very handy for picking periwinkles. Darning has been outsourced to the Poles by the busy women of today and needles are as hard to find as a haystack. Fair play to the Poles. There wouldn't be a shirt button intact but for the new Irish. The vendor said to us, "Ye never ever left me down. Ye are always very good to me." I never met the man before in my life. There was no price. The donations were voluntary. The old boy's cloth emblems were very like St Patrick's Day badges and yes this was every bit as big a win as the Grand Slam on the feast day of our Patron Saint in Twickenham. The merchandiser assured us the cloth came from The Holy Shroud of Turin. The religious iconography was surely a portent. Jonathan Sexton says his prayers. He was driven by a high cause and he drove New Zealand back with every tackle. I spoke to him on Friday and he was confident. "I have a good feeling," he said. There's a good chance he will be named as World Rugby Player of the Year. The awards ceremony will take place in Monte Carlow, which is no journey from Tullow. If he does win, and surely he deserves the honour, there will hardly be a word spoken. It's all about 'us' and 'me' is a word he never uses. I swore to protect the babe in swaddling clothes from the devil but there's a bit of the devil in him. The child never stopped roaring at the christening and he's still at it. Jonathan is Joe's emissary and he is the only player I have ever seen in any code, or any sport anywhere, who is totally calm when he's going mental. Peter O' Mahony is probably watching the game on Sexton's sofa on this fine Sunday morning. The two warriors are very close. This was O'Mahony's finest hour. He tracked back for one try-saving intervention. The Cork man executed more turnovers than a lazy man having a long lie in but he was far from lazy. The work rate was beyond human endurance. His body gave out. Peter played through the pain. The adrenaline kept him going when he pulled a hammer. The fire kept Peter going until the mechanics of gait and movement failed and derailed. Peter was Ireland's rock. It was the first time one of our crowd ever shouted, 'Up Dev'. Devin Toner went up so high his hair was frizzled by the floodlights. His finest hour. Kieran Marmion came on for the greatest nine in the world. He was a sweeper. It was as if Marmion had seen the movie before. His uncanny anticipation saved the day several times when the Blacks kicked through the first-up Irish defence. There wasn't an Irish man who didn't answer Ireland's call on a night when the teams had two anthems each. Rory Best stepped up to the Haka and his players followed. We were reminded of Brendan Foley's words to Moss Keane when they watched the Blacks war dance 40 years ago in old Thomond. "Moss, I think we should ask them to dance," said Foley. And now we must remind a colleague from the 'New Zealand Herald' of his words from three years ago. The journalist is no Nostradamus. The sage from the page wrote that "Sexton has all the skills but no bottle when it counts." Since the personal attack, the aforementioned Sexton has beaten the All Blacks three times and has drawn once. We started out on a positive note, and we will finish up in the same vein. The bookmaker Eric Browne lived two doors away from the Sexton house here in Listowel. Eric won an All-Ireland minor medal in 1962, which means he is 76. Eric sent me this text late last night when he was well into the second moiety of the victory gallon. "Great 2 live 2 see the day." I'm going to put that one on the T-shirt.